The Sarawak Corridor of Renewable Energy (SCORE) is a dynamic long-term development project that offers exciting new opportunities for companies looking to expand their operations and geographic reach in Asia’s fast-growing markets. 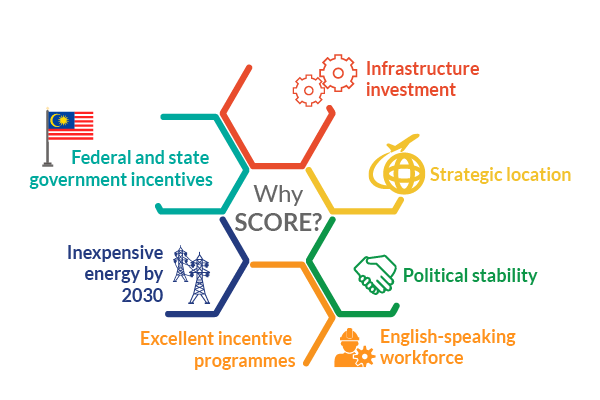 With inexpensive and abundant hydropower energy, new highways, ports and airports and unmatched financial incentives for overseas investors, SCORE provides the perfect setting for rapid business growth. Federal and state government incentives include 100% Pioneer Status tax exemption for 5 years for approved investment projects – and 100% relief for up to 10 years for major strategic investments. Sarawak is located at the crossroads of Asia. It offers a young, capable, English-speaking workforce, a stable, transparent political environment and a legal framework based on the British system, guaranteeing full protection of intellectual property rights such as patents and trademarks. In the World Bank’s Ease of Doing Business report for 2016, Malaysia ranks 18th out of 189 economies, well above France, Spain, Japan and China. The state government has set up an energetic and well-resourced support organisation, RECODA (the Regional Corridor Development Authority), headed by the Chief Minister of Sarawak, to attract new investment and help companies discover and make the most of these great opportunities. RECODA can provide research and information, independent advice and practical help with assessments and Pioneer Status applications, all completely free of charge. It is a one-stop shop for potential investors, dedicated to smoothing the path to successful projects. RECODA’s highly professional consultants and support staff can assist you with everything from visa applications and corporate registrations to finding the right location, recruiting staff and making contact with local authorities, suppliers and professional service providers. RECODA works closely with agencies such as the State Planning Unit, the Malaysian Investment Development Authority, the Bintulu Development Authority and the Sarawak Timber Industry Development Corporation to ensure that investors receive a friendly welcome and full cooperation and support from their very first visit to Sarawak. Sarawak, Malaysia’s largest state, is located on the northwestern coast of the island of Borneo, just across the South China Sea from the vast markets of Greater China, South Korea and Indonesia. It is known as Bumi Kenyalang, the Land of the Hornbills. It has a unique history – ruled first by the next-door Sultanate of Brunei, then, for a hundred years, by the Brooke family, ‘the White Rajahs’, before becoming a British colony in 1945 and eventually part of Malaysia in 1963. In recent years, however, Sarawak has modernised rapidly, relying less on its natural resources of oil, gas and timber and developing particular strengths in manufacturing, high-tech industries, modern agriculture and the services sector. Ambitious hydroelectric schemes have provided reliable, clean and inexpensive power and major infrastructure projects like the Trans Borneo Highway have transformed the economy. Sarawak has a multicultural population of 2,650,000 people, with Bahasa Malaysia and English as the common languages. The capital city is Kuching and the SCORE region covers 70,000 square kilometres of the state’s resource-rich central region, from Tanjung Manis in the south via Mukah and Bintulu to Samalaju in the north, where a major deep water port is nearing completion. With easy access to China, Korea, Japan, India, Indonesia and Australia, an educated and affordable labour force, plentiful energy and attractive incentives for overseas investors, Sarawak is ideally positioned to become a major industrial centre for the region. Sarawak has two international airports, at Kuching and Miri. In addition to existing international flights, direct services from Hong Kong to Kuching International Airport began in early 2016 and the airport already has one terminal that is large enough to handle Airbus A380 superjumbo flights with 500 or more passengers. On the ground, the backbone of the road network in the SCORE area is the Trans Borneo Highway, stretching more than 2,000km, which is being expanded and upgraded. New feeder routes and smaller roads throughout the area are being built under the government’s Rural Basic Infrastructure investment project, providing improved transport for both local people and businesses. For many companies, though, the key element in Sarawak’s infrastructure is its range of excellent port facilities, providing direct access to the busy shipping routes of the South China Sea. Bintulu, right in the heart of the SCORE area, already has one of the world’s largest LNG export terminals, second only to Qatar, and aims to become the hub port of choice for the whole East Asia region. There are other major ports at Kuching, Sibu and Miri, and Tanjung Manis, near the mouth of the Rajang River, is being developed as the essential regional export location for halal products from the fast-growing Tanjung Manis Halal Hub. But some of the most exciting developments are taking place at Samalaju, where the facilities have been improved over a five-year period to create a world-class deep water port that is now fully equipped to meet the specific needs of heavy industry and international companies with intensive energy requirements. Investors in Sarawak can benefit from many attractive incentives – including the Pioneer Status scheme, which allows for full 100% tax exemption for 5 years – offered by the Federal Government of Malaysia. Investors who qualify for Pioneer Status elsewhere in Malaysia only pay tax on 30% of their income for the first 5 years. But in Sarawak, all income is currently exempt from tax for at least 5 years after production starts. For major strategic projects, 100% income tax relief can extend for a period of 10 years. Other valuable Federal Government incentives include generous Investment Tax and Reinvestment Allowances and exemption from import duties. There are also further incentives – including preferential land prices, cheap electricity and low water rates – provided by Sarawak’s state government. For further information about the many Federal Government incentive schemes for investors, see the Malaysian Investment Development Authority website.